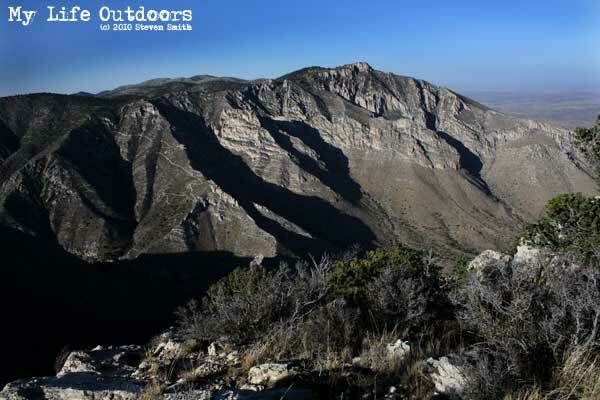 Guadalupe Peak – 8,749 feet – Highest point in Texas. 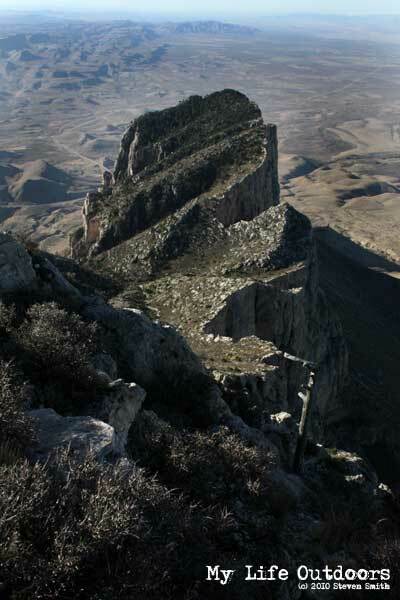 Guadalupe peak is the highest point in Texas at 8,749 feet. Last April a good friend and I set out to summit on a two day backpacking trip. 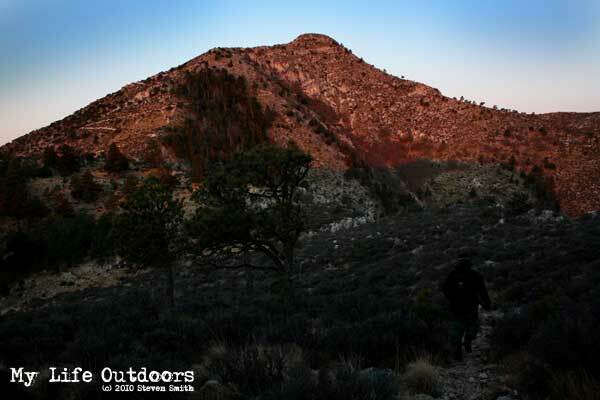 The hike to the peak can actually be done in a fast day trip with the trail to the top lasting just over 4 miles. A group of teens and I once made it to the peak and back in less than five hours one unusually cold august day. 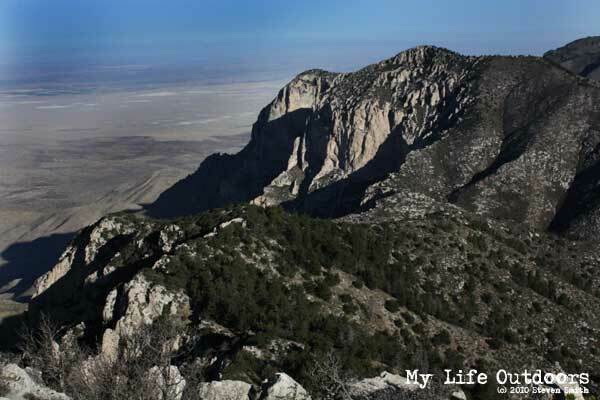 But this last April we wanted to take our time and spend the night at the Guadalupe Peak Campground. The Trail leading to Guadalupe Peak, and campground. We started our ascent around 9:00 am on a beautiful Thursday in April. Our packs were heavy with the water needed for the two days and cooking we had planned to do. The trail starts at just over 5734 feet at the Pine Springs Camp Ground. We started up the steep switch backs on the east side of the mountain. Within the first mile we had already reached and altitude of 7,000 feet. We stopped under a ledge to shelter us from the signature gale force spring winds as we took in the abundant views of the east desert foot hills. Me sitting on the edge of the trail with the view to the east behind me. Just a little further along the trail we crossed a ridge exposing us to the northern side of the mountain. Wind seemed to pick up at this point were the trail is less steep rising another 1,000 feet over two more miles. Looking across the valley you see Hunter Peak (8368) to the north. Along this stretch in the trail you enter the “Sky Island” where vegetation begins to change from the arid Chihuanhuan Desert below to the large ponderosa pine forests of the higher elevations. Hunter Peak (8,368 feet) across the valley with the Tejas trail snaking up its side. We stopped along this stretch to eat a late brunch consisting of some fresh fruit and cereal bars. Not wanting to waste any time we started up the second batch of switchbacks before leveling off at around 8,000 feet near the Guadalupe peak campground. The campground area viewed here from above. Our campsite was just beyond the left hand ridge. The campground is a relatively flat meadow about three to four hundred yards Northeast of the trail. Since we were the only ones on the mountain that day we had our pick of campsites. The main factor to consider when picking a campsite is the wind. I don’t know how to describe the force of the winds during spring time. You literally face gusts of up to 100 mph in the higher elevations. 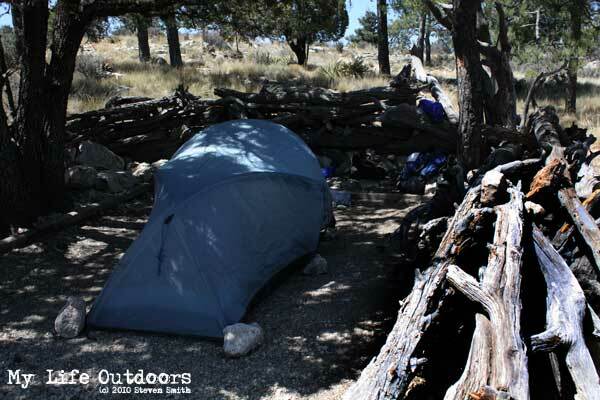 At one of the campsites, previous campers had built a wind block surrounding 3 sides out of downed trees. We looked at all the sites and decided this would provide our best shelter from the wind. We set up our tent and decided to go bushwhacking around the area until dinner. Our campsite with a wind block made out of downed trees. Sunrise. This shot was taken near our campsite. 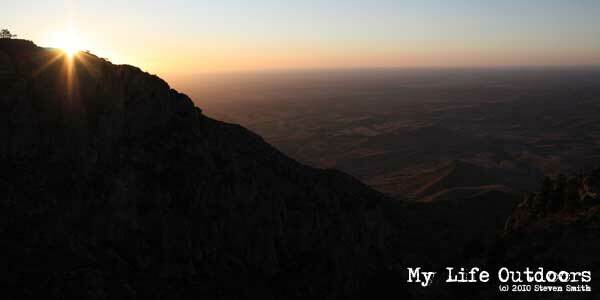 We had planned to wake up early and summit in time to watch the sun rise. When the time came however the wind was blowing so hard neither of us dared summit in the dark. So we stayed in our warm sleeping bags and waited for the wind to die down. Heading to the summit in the early morning. Alpenglow can be seen on Guadalupe Peak. Just after sunrise we left our campsite and gear to finish the last mile to the summit. Just past the campsite along the trail to the summit is a man made wooden bridge. At around 8200 feet I have been told it is the highest bridge in Texas. Considering not many things in Texas exist at or above 8200 feet I am apt to believe it is true. On either side of the bridge the trail encounters quite a bit of exposure looking down into the valley. The last mile of the trail is the steepest and hardest but also the prettiest with the ponderosa pines reaching well over 100 feet tall. Highest bridge in Texas resting somewhere around 8,200 feet. 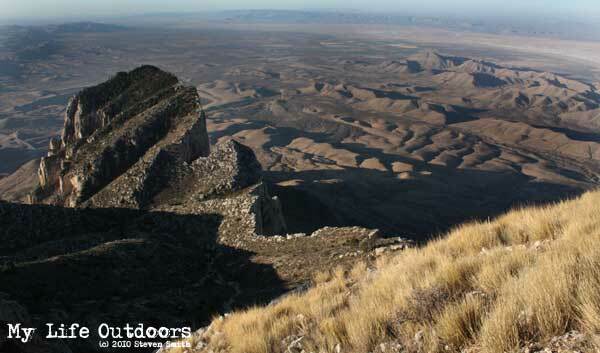 As you near the summit views of El Capitan (8085 feet) the signature peak of West Texas can be seen from above. 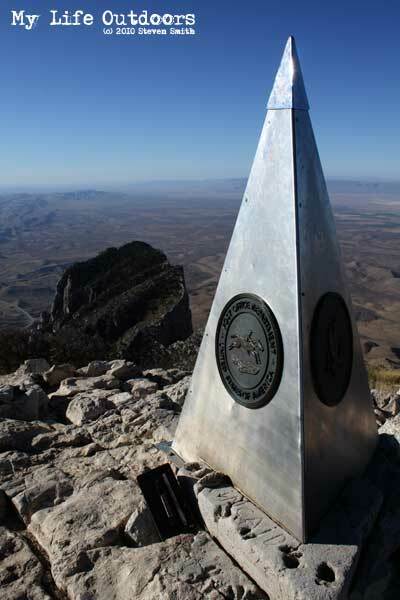 Marking the summit of Guadalupe peak is a Stainless Steel pyramid placed there by American Airlines in 1958 to commemorate 100th anniversary of the Butterfield Overland Mail, a stagecoach route that passed south of the mountain.Alongside the pyramid is a green ammo can with a summit log inside. American Airlines 100th anniversary of the Butterfield Overland Mail commemorative perymid marking the summit. The ammo can with summit log inside can be seen at its base. El Capitan in the background. We signed our names and proceeded to play around on the peak for about an hour. 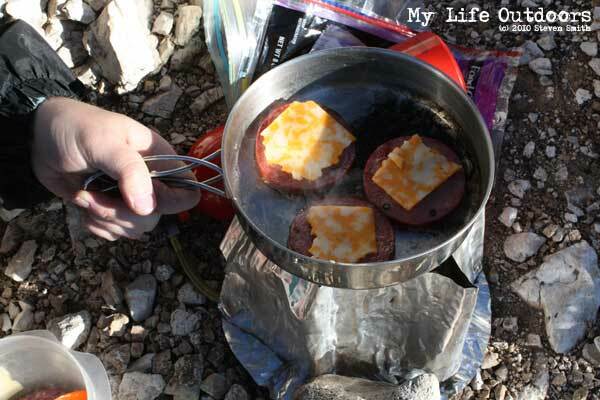 We had brought along some more summer sausage and the rest of the cheese to cook on the summit. It was a great breakfast with an unbelievable view, the highlight of the trip. Heading down around 9:30 am we stopped to pack up our campsite before and heading home. Signing my name in the summit log. 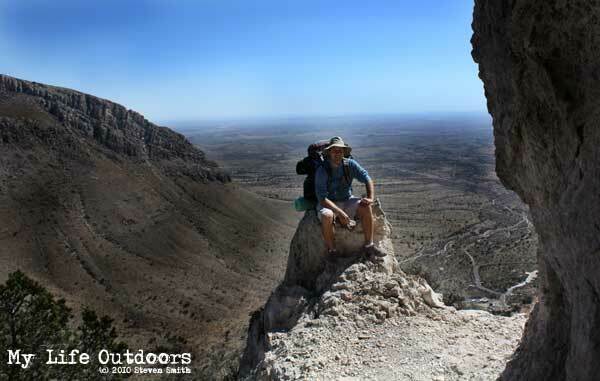 Guadalupe Peak Trail is a difficult trail with elevation gain of 3,015 feet over 4.17 miles. There is no water available anywhere other than the trailhead. Winds should be considered a hazard with gusts up to 100 mph. Bring good shoes and plenty of water. Be sure and check out the rest of the park. 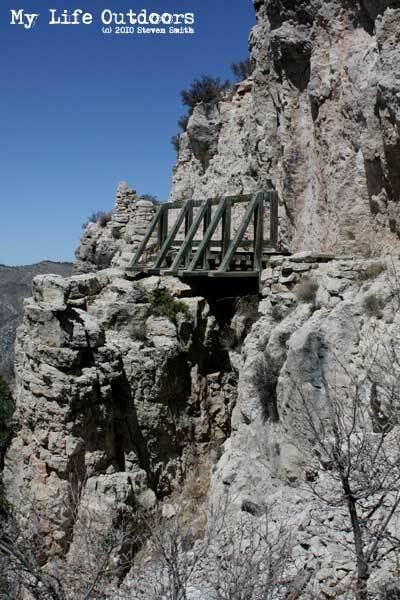 Guadalupe Mountains National Park has more than 80 miles of trails available for hiking. Ummm. Breakfast on the Summit. Shumard Peak (8,615 feet) and New Mexico in the distance. El Captain (8,085 feet) viewed from above just short of the summit. El Captain (8,085 feet) viewed from the Guadalupe Peak summit. 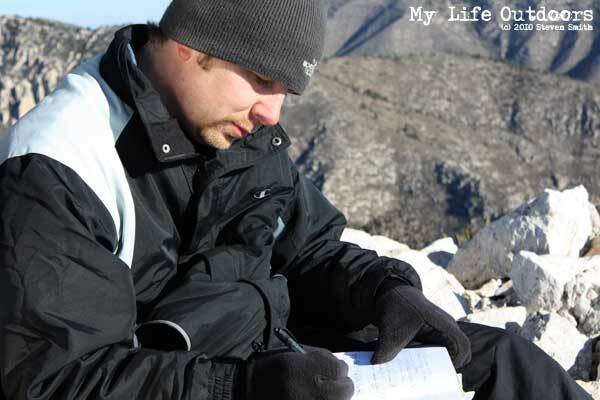 I use both the Map and Guide book featured below when planning my many trips to the Guadalupe Mountains. I highly recommend them to anyone wishing to hike there. Purchase them through these links and help support MyLifeOutdoors. Nice pictures, I hiked up to the summit this past fall and did it as a day trip. It took about 5 hours round trip. It was my first visit to the park and I was impressed. When the weather warms up a bit again I want to try some of the other trails in the Gaudalupes as well. Thank you…I too want to spend some more time there. I hope to find time to summit Bush and Hunter…maybe even bushwhack out to Shumard. I am saving Mckittrick canyon for October. With it so close I can't resit falling in love. Great blog! So glad I found it! We are heading over to the Guadalupe Mtns. next week. I want to climb to the top of Guadalupe peak. I'm in decent shape but we are traveling with my in-laws and our children. I was wondering if you thought it could be done in 5 hours or so by two able bodied adults? In my opinion…its more mental then anything else. We took a group of teens one year (all of which were in good shape) and half of them bailed out in the first mile. It is a steep climb with most of the elevation gain in the first and last miles. It can be done in under 5 hours if everyone is prepared mentally for what they are undertaking. Get your stragglers past the fist mile and they will do fine from there. Coming down is fast. I would allow at least 3.5 to 4 hours for your climb up and 1-1.5 hours for the climb down. You will also want to budget some time to play around at the peak. Keep that in mind. And give anyone who is prone to altitude sickness time to acclimate. Some of our teens turned back because they couldn't stop throwing up. Don't let me make it sound too bad…if you have ever done anything like this before it will be a breeze.